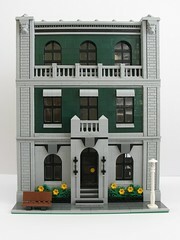 The Psychiatrist’s Office is based on the facade of a bank building in Brisbane. 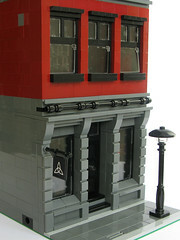 It was meant to be all grey, but that didn’t quite work for the doctor’s office on the first floor. It draws on just a few of the features of the NAB on the corner of Creek and Queensland Streets. The Coveted Clutch is a handbag shop based on the vignette that I use for my avatar. The shop is on the ground floor and there is an apartment upstairs where the store owner and designer of the handbags lives. The Lion Heart Hotel is a boutique hotel with just three ensuite rooms: a single, a double and the penthouse suite. 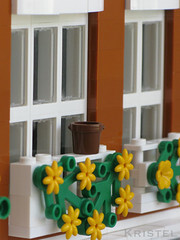 This MOC features two of my favourite LEGO parts – the lion head and the “brick” brick. I loved the overall look of the Haunted House (10228), but must admit I’m not a huge fan of the theme or the minifgures that came with the Haunted House set. 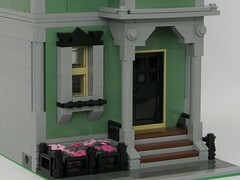 I did, however, feel a desperate need to restore it to its former glory and convert it to a modular building. The Sand Blue Townhouse is a three-level townhouse with lounge, kitchen, bedroom and bathroom. The colour combination reminds me of the seaside, so I’ve tried to carry this through to the interior. 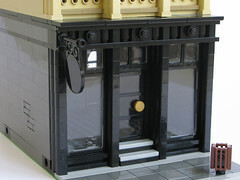 The Black Velvet is a 3-storey New York-inspired building, named after the Black Velvet Cafe on the ground floor. 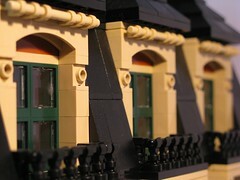 I’m extra proud of this one as it was front-paged on Eurobricks! The Sugar & Spice is another New York-inspired building, this one named after the cupcake shop on the ground floor. It was started at the same time as the Black Velvet – hence the similarities. There’s an apartment on the upper floors, complete with a rooftop garden. 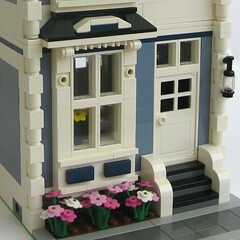 The Blooming Blossoms is a 16-stud wide, 3-storey modular building, named after the florist on the ground floor. I love flowers, so this one was a lot of fun for me to make. The Trilogy Bar and Nightclub features three levels to match your mood, whether it’s drinking at the bar, dancing the night away with the live DJ or just lounging around. 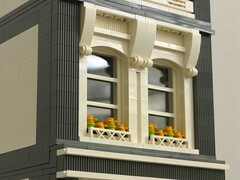 This one has a fair bit of sentimental value to me as it includes much of one of the first facades I ever built. 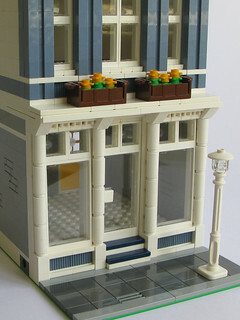 The Beloved Belle, which is named after the wedding dress shop on the ground floor, is my first corner modular building. It also has two fully furnished apartments. It was inspired by the balconies in beautiful Bilbao, Spain. 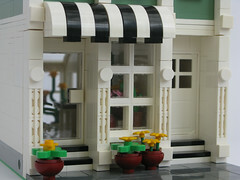 The Cast Iron Modular was one of the eight 16-wide modular buildings that made up The Promenade. As the name suggests, it was inspired by the cast iron buildings found in New York. 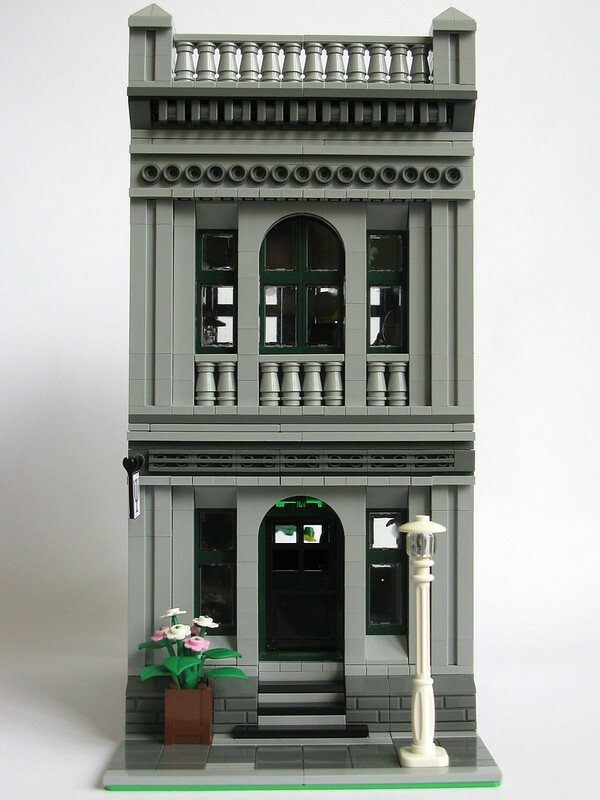 Another one of the buildings that was in The Promenade – my individual layout at BrickWorld Chicago 2015. While the layout overall was inspired by New York, the Sand Blue and White in this building reminds me of the sea. Hence the name – Blue Shores.